Here am back with a lip-smacking breakfast recipes where oatmeal is the star ingredient. This is my third post sharing yummy recipes for weight loss. Making a space for oatmeal in your pantry shelves is a very good idea these days. Is oatmeal good for kids to gain weight and adults to weight loss? The answer is a big YES. Here is the reason. Oatmeal works for either goal. For those who need to lose weight with oatmeal recipes must follow these instructions. Use low-fat milk, add low-fat yogurt or Greek yogurt, add chia seeds, whether fruits or nuts add very fewer toppings, drizzle very less natural sweet like honey, dates puree etc. So as long as you don't add more sweeteners and toppings, a bowl of oatmeal (not more than that) won't break your calorie budget or weight loss diet. For those who want to gain weight with oatmeal recipes must follow these instructions. When you add more calories and proteins rich ingredients in your oatmeal like nuts, fruits, honey, dates puree or sugar, full-fat milk, butter or ghee (for kids), weight gain powders etc, for sure this will supports you to gain weight. Recently I have got many requests from my readers to share more weight loss recipes. 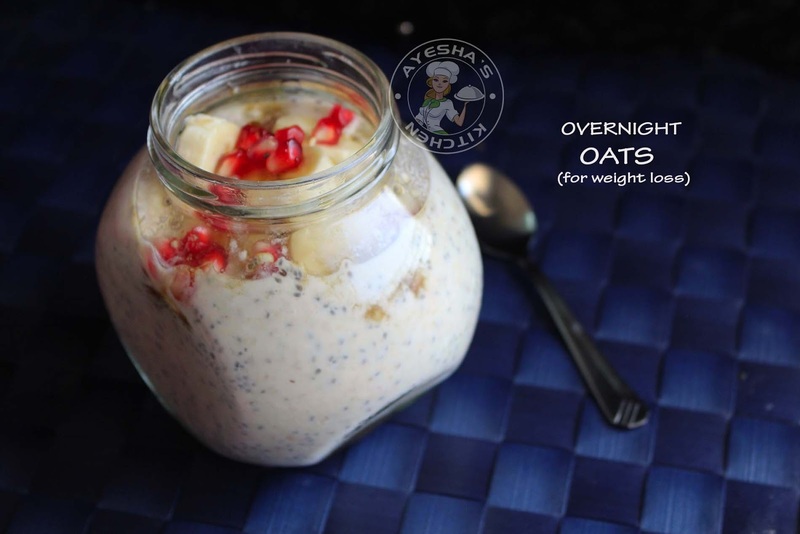 So I thought of sharing a healthy diet oats recipes - Overnight Oats. When I heard about the overnight uncooked oats for the first time, I have piqued no end. But now, am in love with this easy simple yet yummy breakfast. Overnight oats are very easy to prepare but some people won't like its taste as it is flavorless and tasteless. 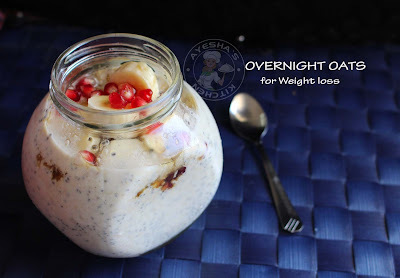 So here is my recipe showing how to make overnight oats very tasty and yet contribute to weight loss. For making overnight oats recipe, the oats must be soaked in water for at least 5 hours or overnight and must store in the refrigerator until use. Here I soaked the oats in fresh coconut milk which enhances the flavor of this dish (or you can soak it in low-fat milk instead for those of you who dislikes its flavor). In the morning or after 5 hours, add chia seeds (great for weight loss), fruits like banana (half of a banana sliced is enough), pomegranate, and drizzle a teaspoon of honey for the sweetness (if required only). One of the best ways to eat fruits in the morning is through fruit oatmeal. Isn't it? Actually, the sweet from the fruits are all enough to complete this oatmeal. Meals that do not require cooking or much cooking are an added joy. This is the one reason which I love to experiment with overnight oats. I have tried many different yummy weight loss recipes with oatmeal. Hope I can share it soon on my blog. Like so, will share oats for dinner weight loss soon. 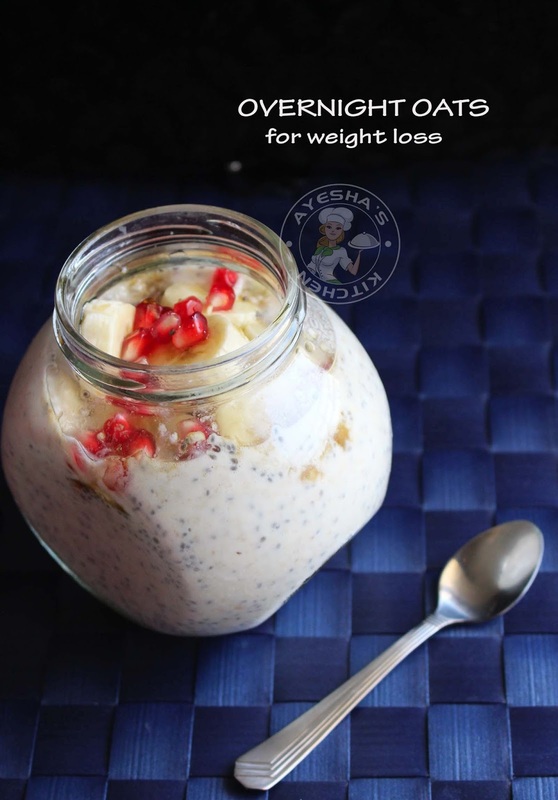 Here is the recipe showing how to make oats recipes for weight loss/low cal overnight oats/banana overnight oats/healthy oats breakfast/best overnight oatmeal/overnight chia oatmeal/overnight oats with fruit/oatmeal diet/best oatmeal for weight loss/quaker oats recipes for weight loss. In a jar (i took a big glass jar or you can use two small jars instead), add oats. If you are using two glass jars, then add half a cup of oats in each jar. To this, add coconut milk (can use almond milk, low-fat milk instead ). Mix with a spoon. Keep it in the refrigerator for at least 5 hours or overnight. The next day while serving, add chia seeds and mix well. Then top it with pomegranate seeds, chopped banana, and drizzle honey (if required). For more details, please check the above video. Have it for breakfast. It is very good for those who are following weight loss diets. It's yummy too even I liked it very much.